Carnivorous plants and seeds for sale online in the UK. Carnivorous plants are those that get nutrients from trapping small insects. 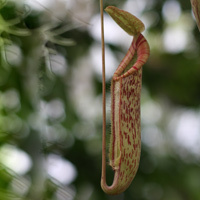 Carnivorous plants include the well known 'Venus Fly Trap' and 'Pitcher plants'. Carnivorous plants are popular for their exotic forms. Over recent year a much wider range of carnivorous plants have become available with specialist nurseries using a wide range of techniques to grow some fantastic plants. Many are suited to growing indoors and some require a hothouse or conservatory. Nepenthes or pitcher plants are some of the most fascinating forms available, the venus fly trap however is on of the easier plants to grow and is readily available from garden centres. Most good nurseries will provide comprehensive growing notes for all plant sold. Growing from seed is the cheapest way with all plants, however established plants are a much easier path to follow with most carnivorous plants. Specialist nursery stocking sempervivum, plumeria, adenium, myrrh, coffee, cotton, willy chillies, novelty moving plants, exotic fruits, mimosa, silk tree, acacia, dried gourds, ginseng, carnivorous.